« How “Efficient” is the Stock Market? To be able to day trade and make money, a trader also needs to focus on his health and that of his loved ones. Money means nothing if those you care about are not healthy. That’s why I wrote this blog post. In 1996, my mom was diagnosed with multiple sclerosis (MS). Since then, her health has gradually deteriorated, picking up speed during the last few years. As a result, I embarked on a trip with her to Argentina to see Doctor Fernandez Vina, a world-renowned pioneer in the field of human stem cell therapy, based on the referral of another MS patient. We returned from our trip on July 14th (all pictures are at the end of this post). 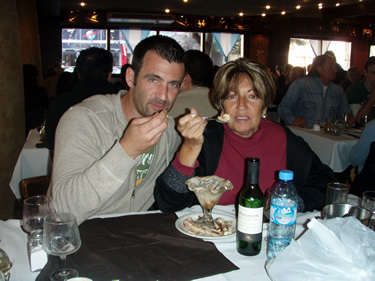 Outside of the United States (which severely lags the rest of the world in stem cell therapy), there are various medically recognized stem cell treatment centers; Fundacion Don Roberto Fernandez Vina in Argentina (or “Fundacion Fernandez Vina” for short) is one of them. Doctor Fernandez Vina has had a lot of success treating Diabetes, MS, and other conditions. Not only was our trip to Argentina great, the attention and treatment we received from all members of the Fernandez Vina foundation was excellent. Everything was extremely well-coordinated, since the moment the contracted driver (from Confort Car) picked us up at the airport. The drive from the airport in Buenos Aires to San Nicolas de los Arroyos, the city where the stem cell treatment took place, was around two and a half hours. 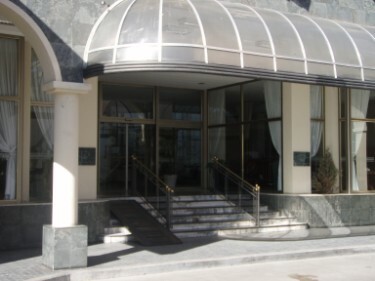 We arrived at the San Nicolas Plaza Hotel, which was already included as part of the treatment package, for a few hours of rest before our multi-day stay at the hospital where the treatment was supposed to take place (around 3 blocks from the hotel). The Plaza Hotel was very nice and clean, and the staff was very courteous and helpful. We were picked up late in the afternoon and taken to the hospital for preparation for the treatment on the following day. I was very impressed by the quality of the hospital and its cleanliness. The nurses and staff were great; always very helpful and supportive. The room was equipped with cable TV with plenty of channels (as well as funky Argentinian shows). 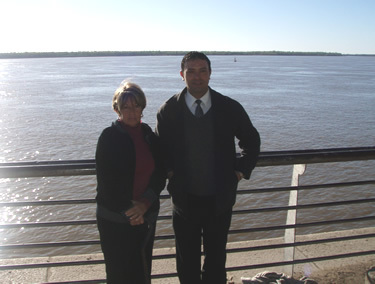 On that same day, we met Doctor Fernandez Vina and his assistant, Doctor Janina (see picture at the end of post). All I can say is that they were wonderful, with a genuine concern for their patients and their well-being. My mom really felt at ease with them and that helped a lot with her nervousness (she’s a bit of a sissy when it comes to doctors…Heh…Heh!). During the next morning, bone marrow was extracted from my mom’s hip bone under general anesthesia. From this marrow the stem cells were later extracted and a few hours after that, Doctor Fernandez Vina implanted the cells through one of my mom’s leg arteries. The implant procedure took less than an hour. My mom had to spend the day after the procedure in the hospital under medical supervision and one day on bed rest at the hotel. The day after that, Luis Quintana, the owner of Confort Car, took us on a tour of the beautiful, nearby city of Rosario (see pictures and Confort Car’s contact information at the end of this post); and then on a few hour tour of Buenos Aires on the day of our departing flight to Miami. Luis was truly helpful and took us to different places looking for gifts for our family members and friends. He was also an excellent tour guide. If you or anyone you know ever goes to see Dr. Fernandez Vina, I strongly recommend that you use Luis Quintana’s personalized tour guide services. It’s been around two weeks since my mom had her treatment; so it’s too soon for the stem cells to complete their repair function, but we’re already seeing some dramatic changes. The MS had affected mainly my mom’s balance and coordination. She could not really walk without a cane anymore and constantly swerved to the sides, bumping against objects in her path if unassisted. To my amazement (and that of all our other family members), she was rather quick on her feet yesterday (the day prior to this post) when we paid her a visit. She wasn’t swerving to the sides and didn’t use a cane at all while we were with her. It’s a truly amazing change given her previous condition. I can’t wait to see what other changes lie in store for her and thank God for all the blessings bestowed upon her so far. 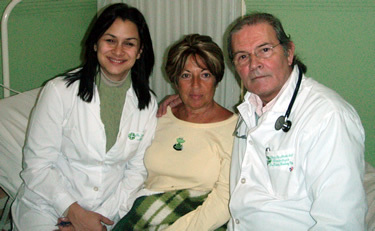 For those of you who have family members suffering from multiple sclerosis, diabetes, or any other condition for which the traditional medical community doesn’t have a cure and probably no financial interest to find one, I strongly suggest that you contact the Fundacion Fernandez Vina in Argentina. God Bless you all and your loved ones! 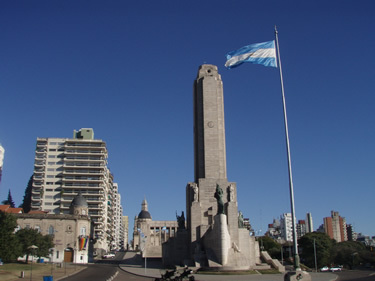 The Monumento Nacional a la Bandera (National Flag Memorial) in Rosario. We couldn’t go up the elevator because it was undergoing maintenance, but the rest of the memorial was very nice. 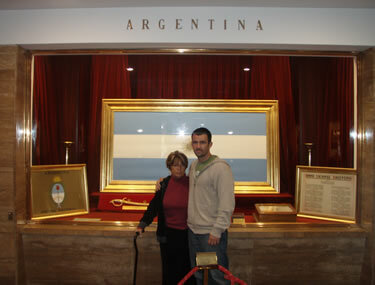 Mom and I standing in front of the Argentinian flag, inside the National Flag Memorial in Rosario. 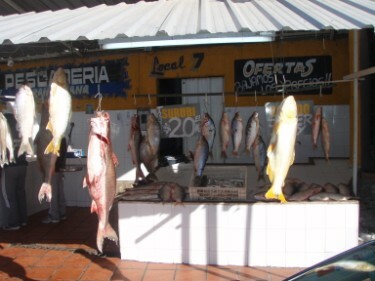 Rosario fish market displaying an assortment of fresh fish from the Parana River. Breaking the diet at La Estancia, a well-known Argentinian steakhouse, in Rosario. The filet mignon was awesome and so was the Benjamin Nieto Senetiner Cabernet Sauvignon! On the way to Ezeiza International Airport in Buenos Aires. 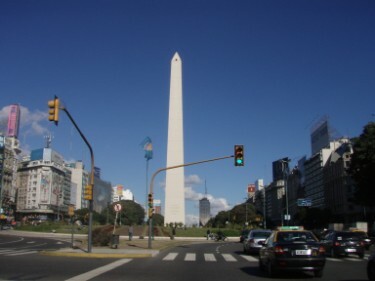 Background shows the Obelisco de Buenos Aires (Obelisk of Buenos Aires), one of the main icons of the city. 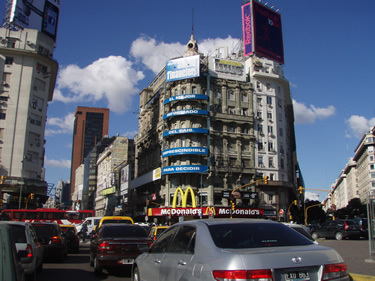 McDonald’s Restaurant in Buenos Aires. I wonder if they serve churrasco there. 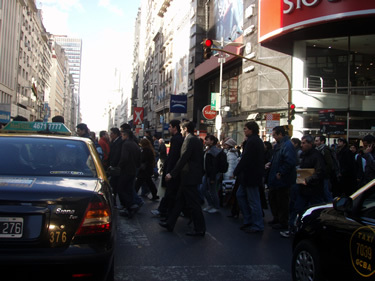 Busy city of Buenos Aires. It reminds me a lot of New York.